Let the spooky outfits continue! I've kept my word so far and I plan to keep them coming until Saturday. Like I've said before; dressing up in costumes isn't my thing, but wearing spooky inspired outfits appropriate for everyday life certainly is! 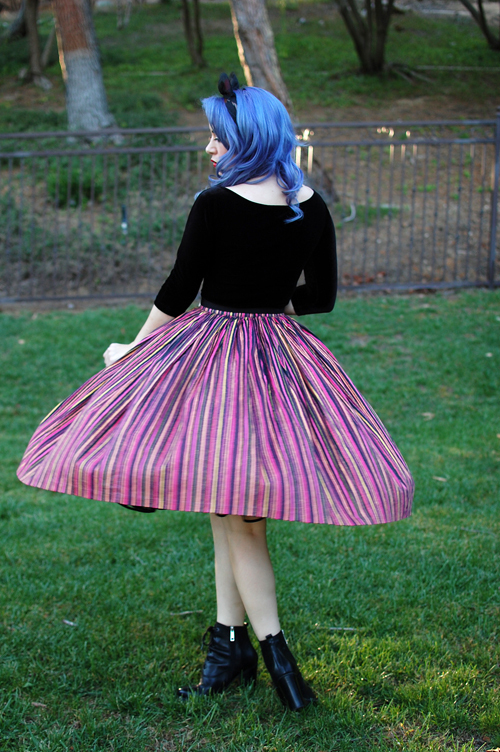 This warm cabana striped skirt always felt more like Halloween to me, so it seems fitting to wear it this time of year. I can assure you it gets wear all year around though. I went for a more "witchy" vibe with black pieces and my favorite new boots. I finished this look with my trusty Sandworm brooch. You've probably seen him a lot because I wear him almost everyday. It's so hard not to play favorites! Today I'm having a pretty intense doctor's appointment and I'm not too crazy about going. I've been having some health issues (I've literally told nobody else except my husband until now) and I really need to know what's actually wrong with me. I've always been a "blissfully ignorant" kind of person, but now that I'm a mother, I feel like it's my responsibility to be healthy for her. It's kind of scary to have to investigate this, but I'm doing my best to be strong for Bianca. Keep those fingers crossed for me, I need all the positivity I can get!